U.S. President Donald Trump told his Turkish counterpart Recep Tayyip Erdoğan that Washington was working on extraditing Fethullah Gülen, the U.S.-based leader of the Gülenist Terror Group (FETÖ), Foreign Minister Mevlüt Çavuşoğlu said on Sunday. 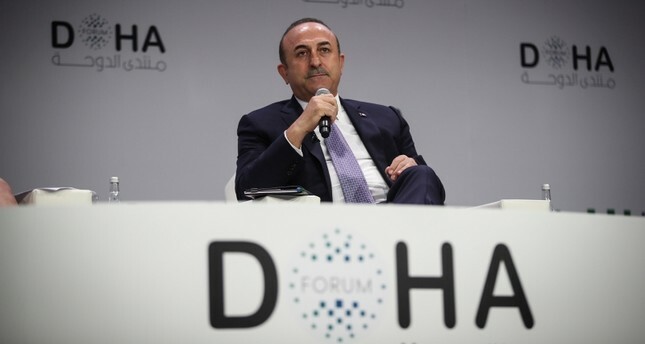 "In Argentina, Trump told Erdogan they were working on extraditing Gülen and other people," Çavuşoğlu said at conference in 18th Doha Forum in the Qatari capital Doha, referring to the G20 summit in Argentina from Nov. 30 to Dec. 1. The U.S. remains the main hub of FETÖ, where the shadowy group operates hundreds of charter schools and affiliated companies, providing visa and employment opportunities for thousands of its followers. Gülen has lived in a self-imposed exile in a secluded compound in the U.S. state of Pennsylvania since 1999. Erdoğan said last week Turkey would start new initiatives abroad to target the financing of Gülen supporters. "I have recently seen a credible probe by the FBI on how the Gülen organisation avoids taxes," Çavuşoğlu said. "Everyone should consider working with Assad if he wins democratic elections"
Çavuşoğlu also told the conference that everyone including Turkey should consider working with Bashar al Assad if he wins a democratic and credible election in Syria. The minister said that what Turkey is trying to do is to contribute to Syrians come up with a constitution themselves for the country. "This process should be under the scope of the United Nations. It should be inclusive. Everyone should be given their rights. It should include everyone inside and outside Syria, it should include those who are located in my country, in other countries, as refugees. There should be transparent and democratic elections. After these elections, Syrians should decide who should run their country," Çavuşoğlu said. Turkey backed the opposition to Assad in the Syrian civil war that broke out in 2011. Assad, whose family has been in power for nearly five decades, managed to stay in power thanks to massive Iranian and Russian military support, but large parts of Syria remain outside his reach, including regions in the north, under Turkish control, and in the east, ruled by a U.S.-backed coalition mainly consisted of PKK-affiliated People's Protection Forces (YPG) terrorists. Çavuşoğlu said he believed Trump was considering a policy of leaving Syria.